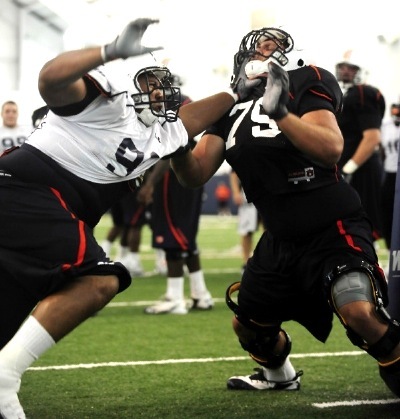 Believe it or not, fall camp is beginning to wind down on the Plains. The team is beginning to make the move from camp drills to actual game week preparation. Auburn had Sunday and Monday off, so they’ve had some extra energy the last two days. We’ll get right to it, but first, as always, be sure to thank your friendly neighborhood beat writers: Andy Bitter, David Morrison, Jay Tate, and Charles Goldberg. — The talk of the day Tuesday was the depth chart, i.e. the progress in ironing it out. Trooper Taylor narrowed it down to seven wide receivers that he can “count on,” and — off the top of his head but in some semblance of order — listed them: Emory Blake, Deangelo Benton, Trovon Reed, Travante Stallworth, Quindarius Carr, Jaylon Denson, and C.J. Uzomah. Not many big surprises there, although I’ve made it no secret that I’m expecting big things from Carr his senior season, so it’s somewhat surprising to see him so far down the list. Still, when you’ve got a guy like him that seemingly has more experience than all four of the guys ahead of him combined, it will probably be hard to keep him off the field once the season begins — especially while the young guys, Reed and Benton, will still be getting used to live bullets in real games. — Since we’re here, I’ll go ahead and be the last to break the news: Barrett Trotter is the starting quarterback. I haven’t yet had the chance to share some thoughts. First, having a quarterback like Trotter in his third year in the Malzahn system is scary enough on its own — but it’s also uncharted waters. After bouncing around at Arkansas for one year and Tulsa at two, this will be Malzahn’s first third-year understudy, and the closest thing he’s ever had to a returning starter. It will be very interesting to see in the first few games how he handles the offense compared to the last two guys who were in it for just one season. Meanwhile, on the flip side of the coin is Clint Moseley. All I will say is that for a guy who in the spring admitted to throwing himself “pity parties” and being in a bad place, I hope he can find a way to stay out of that funk this time around. I seem to recall a guy named Newton that faced a lot of adversity in his career, as well. — Getting back to current events, there was more depth chart talk on Wednesday. Cornerback Ryan White named the starters there as T’Sharvan Bell (duh) and Chris Davis. When Bell moves in to play the nickel, White will be the third man to come in and take his spot on the edge. He also apparently sometimes misses playing quarterback. I think I understand why. “No contact in practice,” he said. — Finally, Emory Blake says that we’ll see more of the hurry-up this year. “It’s going to be more of a weapon that we use more often.” There’s no question that the pace was slowed down at the end of last season, with Newton running the show and the offensive line providing more of a physical rushing attack. But this year, it will great to see the dogs off the leash again, and the offense going a hundred miles an hour. Combine that with the return of the Wildcat, which we were told about this spring, and it’s going to be a beautiful, beautiful sight (if you’re an Auburn fan). ‘Krootin: The coaching staff added two commitments this week on the recruiting trail — both cornerbacks — bringing the commitment total for 2012 up to 15. First came the commitment from Jonathan Jones from Carrolton, Georgia, on Saturday. He’s a universal three-star prospect on the recruiting sites, and ESPN has him ranked best at 22nd nationally at the cornerback position. But Jones is also a track star in Georgia, winning state in Class 3A last year in the 110 meter and 300 meter hurdles, while taking home the all-points title and landing his track team its second straight state title. Then on Tuesday came the commitment from T.J. Davis from Tallahassee, Florida. He’s either a 3 or 4-star depending on your recruiting site of choice, and is ranked best by ESPN (once again) as the 11th best cornerback nationally. But all you need to know about T.J. is his offer list; Alabama, LSU, Florida State, Ohio State, Florida, Notre Dame, and many more all wanted him on their campus. Instead, he’s coming to the Plains. There are plenty of notes and quotes from the commitment announcements for Jones and Davis, but let’s get right to everybody’s favorite part: The highlights. Davis has a great reel from his junior year here, and some film from his sophomore year as well, here. Not to be outdone, Jones has some excellent highlights here and here. If there’s one thing we can take from this, it’s that with these guys joining Joshua Holsey in February’s signing class, the future is looking up for what has been fragile secondary of late. That, and that I could watch Jones showing off his speed on those quick end-arounds from the wing all day. What’s with the hightened expectations of Q Carr? Why not? He’s a senior and a veteran among the young receivers and, really, the entire offense. He hasn’t been able to realize his full potential just yet, but we’ve seen flashes of brilliance from him before. And he’s moving from the “9” spot to the “2”, which would seemingly be more of a fitting target for Barrett Trotter. Can you imagine getting Carr out on those quick bubble screens and letting him utilize his speed? I just expect him to be a lot more than just a “deep threat guy” this year. I hope you’re right justin, but after watching him muff punts I have no confidence in the guy until he consistently proves otherwise. And I realize you are talking about him at the receiver position rather than punt returner, but he is snakebitten IMO and until he gets over that he won’t realize his potential. In the mean time there are a ton of young guns chomping at the bit for those targets. I can understand the frustration with some of his struggles fielding punts, I suppose, but as you said, we’re talking about two completely different positions. And I’m not entirely sure which “young gun” is going to come in and take his spot. You’ve got Blake and Benton working at the 9, while Reed and Bray are on the inside, and I think it’s a whole heck of a lot to ask for a true freshman like Denson or Uzomah to come in and outperform a fifth year guy like Carr that has been around since 2007. As it stands, Carr and Stallworth will be in the rotation at the 2, and without Darvin Adams and Terrell Zachery catching 80% of the team’s passes like they have the past two years, I expect Carr to get plenty of opportunities. And based on his play at the wide receiver position — NOT as a punt returner — I expect him to perform well.